Most people rely on their electric stove for cooking. For survival preparedness (without electricity), you might also consider other methods. We have available to us (in the grocery stores) many foods that are already processed in a way that does not necessarily require cooking, and are already free of bacteria and other harmful substances. For example, canned foods can be safely eaten without cooking because they have already undergone a process which destroys harmful bacteria. The food in a survival kit should be selected such that they will not necessarily require cooking. On the contrary, survival food storage in your home should consist of a well rounded variety, some of which will certainly require cooking. For those of you who have natural gas to your home, you probably have a gas stove in your kitchen. For the majority of probable disaster scenarios, your gas supply to your home will remain intact and useable. Given the gas pipeline distribution systems, the likelihood of losing gas pressure is very low (unless purposely shut off). Unless the disaster is enormous in scope, having natural gas to your home will ensure the ability to cook, even without electricity, because most gas stove-top burners will light with a match – although the oven might not light due to modern electronics even in gas stoves. For those who live in rural areas, many (most) will a large propane tank supplying LP gas for things such as stoves, heating systems, hot water heaters, and even clothes dryers. During a power outage you will still be able to cook, so long as there’s propane reaming in the tank. For most people though, they rely on electricity for cooking (electric stove). Electricity is one of the first things to go out during many disasters. Electricity is the single most important system that we rely upon in our modern world today. Unfortunately most people have little knowledge or alternative methods to keep them going (alive?) for very long without electricity. Herein lies the purpose of this post… to think about what you would do without electricity as it pertains to survival cooking. Cooking without electricity. Many methods of survival cooking (e.g. 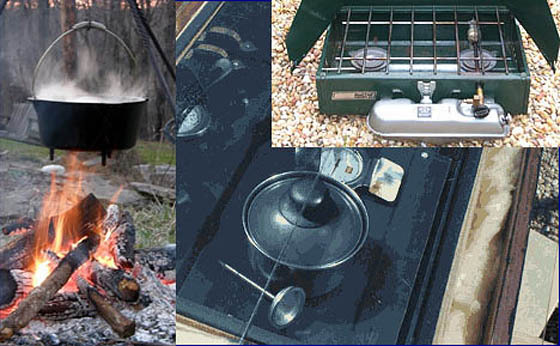 camp stoves) involve the use of fuels such as propane (I also have a small portable butane stove). Their all good up until you run out of fuel. If you already have a a propane stove, butane stove, a BBQ grill, or a ‘white gas’ stove such as a Coleman camp stove or other similar cooking stove, you will (should) also have on hand some amount of fuel for it. Question yourself as to whether or not you have enough. An important consideration for survival cooking is to have a backup plan in case you run out of petroleum based fuels for your portable cooking stoves. This basically leaves two natural sources of energy that can be converted to sufficient heat so as to cook food or boil (or pasteurize) water for safe drinking. They are, Firewood and the Sun. If you had to cook over a fire, do you have what it takes? Do you know how to build a fire? When is the last time that you tried? Do you have a method to support your pots and pans over a fire? A tripod stand to suspend a dutch oven? Do you have an adequate supply of ready firewood? Do you have a wood stove? A wood stove could also be used for cooking. Do you have a solar oven? Did you know that you can cook pretty much anything in a solar oven even though the temperature inside the oven might not reach that of the oven in your kitchen? Most people we know use electricity and we always ask them if they have an alternative way to cook food and they always come up short. We have a backpackers stove that connects to propane tanks and from there we cook with either our regular pots and pans or the ones from our bug out bags. But we also have a chimenea outside in which we can also cook with, including a BBQ that runs on coal (which we have a stock of). So we have a few options. For us, since we live in an urban area, a fire would be the last option for us, but we would be able to do it as we have a ton of bricks on the side of our house to be able to make an enclosure for the fire if necessary. By just stacking the bricks correctly you can build a rocket stove that will take very little fuel and put out almost no smoke. Just be sure that the bricks are dry.Water expands when heated and can cause bricks to explode. Have a propane camping stove , a outside fire pit , and a fireplace that we have cooked in before , this is great for a Dutch oven , bakes great bread too . Be prepared and ready . Keep your powder dry . good suggestion. Thank you. Will keep my eyes open at garage sales. I think your readers are well prepared for off grid cooking. I use a firepit with irons with a Dutch oven, a Webber grill, a camp stove using propane bottles, and use my wood stove top. I opted for electric stove when I moved in my home because gas leaks came from every gas stove in over 30 homes I cleaned that I encountered, and I hated the smell of something dead. The propane additive used to detect it in my area does not smell like the natural gas additive. The first thing I thought of when I saw the picture with the Dutch oven was that it’s using a *lot* of fuel. Why not use a biomass stove? You could run a Rocket stove for weeks with the amount of wood that fire is using. Exactly! A ‘rocket stove’ is a very efficient way to use firewood (pieces of small branches, etc.) for cooking. Thanks for adding the suggestion. You can build rocket stoves from # 10 cans. Also build hobo stoves the same way. I myself have a zoom versa which I love using. I have multiple other ways to cook but that would be my go to unless it was winter then I would be using the wood stove in the house. Impress, yeah! Especially greenhorns up in the rugged Uinta mountains… and those I cooked elk stew over my campfire irons literally licked my Dutch oven pot clean! Being all electric… I went without heat/electricity during Hurricane Sandy for twelve days. I cooked with a sterno stove to heat water for tea, cooking rice and instant mashed potatoes. I also had a single burner propane stove on which I cooked the non-spoiled meat and later canned foods for lunch/dinner. After the electricity came back on I got a Coleman dual burner propane stove where each burner can be used separately. I also got a a propane “Buddy Heater”. I had but didn’t use a NIB Coleman USA made (from the early 70’s) gasoline stove that uses “white gas” or unleaded gas. I have that just in case I run out of propane….. I also have many of the alternative cooking methods, but will share this tid bit. Some time ago while camping, my Coleman stove tank pump crapped out due to my lack maintenance. I didn’t feel like puttering around with it at 6:30 in the morning, so I parked a can of Sterno between the burners to perk a pot of coffee. Then with a fresh cup of hot Joe oiled up the pump and made bacon & eggs. I always wanted to pre-test that problem of pump failure, but lucked out that my back-up plan worked out. Always have a back-up plan!!! Last year I made 2 solar ovens out of card board box’s. Both did very well. You can find the directions on line. We also bought a 800 Watt power converter. If the power goes out we can use it in the truck to make coffee, plug in electric blankets, run a light etc. I use the box solar oven all summer long, can’t wait till the temps warm up. I think my Dad is addicted to alternative camp stoves. He has started collecting old army stoves and just about anything you can use to make a hot pot of water for whatever reason. Growing up we went camping a lot and I would never have to worry about getting lost, I could always smell my way back to the campsite. While everyone else was making burnt hot dogs over a fire, we would be having baked chicken, rice, and gravy in the dutch oven. It was always something. In a survival situation my folks made it through Katrina making food in their driveway, I think my Dad enjoyed that. Secretly I think he wishes for a hurricane every year so he has a good “excuse” to make dinner in the driveway on whatever stove needs attention. They eat better than most when the lights go out. My wife and I were just talking about that yesterday. When we lose power in the winter ( which happens every year) I fire up the generator and run some lights,the T/V and satellite,the fridge and computer while the rest of the neighbors are using candles and flashlights. It makes me feel great to know that my families lifestyle hardly changes because I have pre thought these things and provided for them. I am not looking forward to a full grid loss situation but I do kinda look forward to the short term ( 2-3 day) power losses as I use it as a training exercise to see just what I have missed. I love the chance to practice with our alternative cooking methods,so I too look forward to a major storm. Short comment about stoves. You can make a pretty neat alcohol stove out of a used beer can and back in boy scouts we used to make camp stoves out of an old coffee can. Make a little door and fill with twigs. First one to boil snow was the winner. We use a coleman stove indoors for emergency cooking. I know there is a risk of CO poisoning, however, I calculated the square footage of our home, and it would take an awful lot of cooking to reach those levels. Besides, I can open one of the two sets of french doors in our kitchen or the kitchen skylight. I wanted to be able to cook indoors in case emergency situations arise during winter or a rain storm. Even if you use propane to cook, most newer stoves need a power supply to light burners and ours auto locks the gas in the case of lost power. We either need to fire up gen or we use our inverter/battery bank system. Just a question. If you use the inverter to light the stove can you turn it off after that or does the stove require the constant voltage to keep running? wondering if anyone knows the answer to this..
be a CO risk? or would the risk be similar to having a fire? thank you for info (yup have CO detectors). couldn’t see why, in a pinch, I couldn’t set a old roast of briquettes in the fireplace, but wasn’t sure. I have multiple cooking sources that use any thing for char coal, propane or Coleman fuel. What are the shelf life for these items..
Charcoal and propane last as long as the container .Coleman fuel is good for 10 + years unopened. If I was going to store charcoal I would put it in 5 gallon buckets to keep out moisture . good point/suggestion, to put charcoal in bucket to keep moisture out thank you. I am not a regular charcoal user, and had not thought about moisture. Just bought a gasone butane stove for 17 bucks and have been trying it out its 22 degrees outside and after learning again how or what to cook no problems and extra fuel only 2 dollars each I plan on using this often its just fun to have around. I have the same butane stove as one of my cooking stove supplements. It is reportedly safe for indoor use if I remember correctly. Has anyone recently purchased coleman fuel? I tried walmart and the salesman had never even heard of coleman fuel, or white gas. I haven’t been able to find any. Make sure you have cheap hand sanitizer in your vehicles and maybe an old cleaned tuna can or soda can. You can burn the hand sanitizer in the can for warmth or cooking if necessary.